I hope your day yesterday was as great and amazing as ours at PRESS Gallery! It was busy, and very instructive. The day started with the making of our special 4th of July give away card. Melanie seized this opportunity to teach me the basics of typesetting. We set up the quote from Melanie’s friend Ben Franklin (I mean who is not friends with Ben Franklin?) she had found in the morning before coming to the gallery, and had it sitting next to the Statue of Liberty. The finished Ben Franklin postcard! Next on the schedule was the visit of Cambridge students from England. Why would Cambridge students come to North Adams you ask? To have a look at DownStreet Art and its galleries, a good example of a successful creative placemaking project. 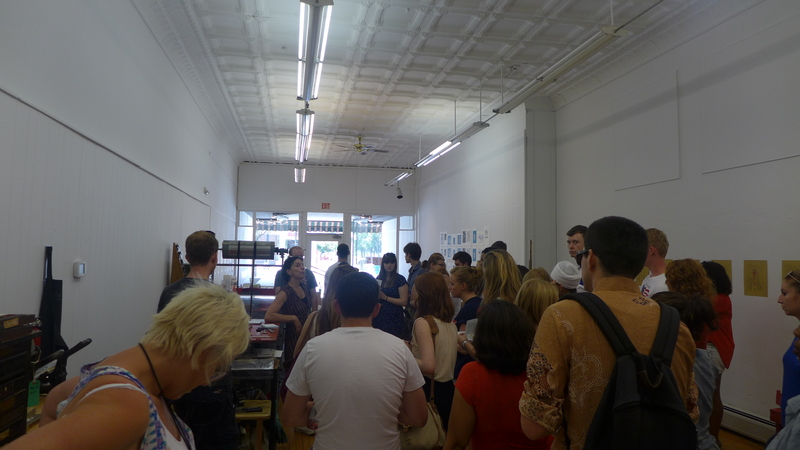 The gallery is very rarely this crowded, and Melanie got to talk about her gallery and her love for letterpress to 35 people! After the battle to get everyone’s purchases completed, Melanie showed me how to clean the press. That’s another skill to add to my set which hasn’t stoped to grow since I got here. And after all the PRESS madness, I went to my first baseball game ever! I am a lot into sports and a fervant soccer fan so I tried really hard to understand the rules. The thing I had the most trouble with though was players stealing bases. From my perspective, it was really hard to grasp the fact that cheating (or stealing) was allowed by the game! I also learnt that baseball was very slow paced and had plenty of time to get myself some hamburgers and icecream. The Steeplecats ended up coming back and winning, and the fireworks after that were amazing. 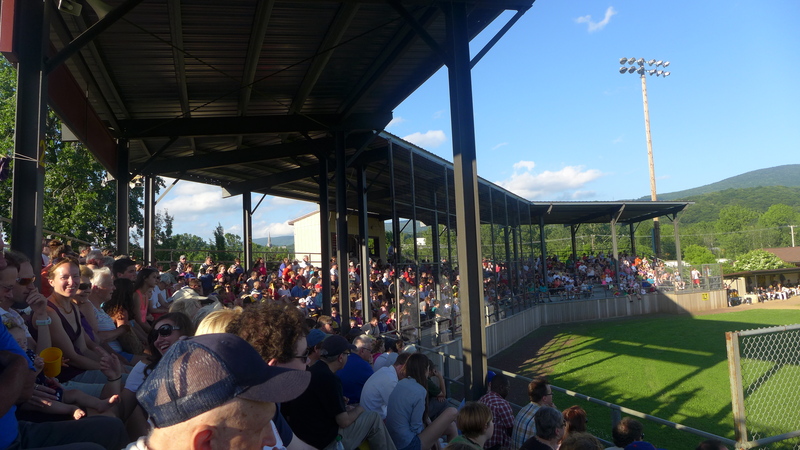 So all in all, it was a great night at the Joe Wolfe Field, and a great day in North Adams! Once again we hope all of you had a great 4th of July. We are starting the preparations for the upcoming shows, Liminality and The Politics of ______, and can’t wait for our next opening on July 25th. If you haven’t seen our current exhibit yet, the art of imPRESS is on our walls until July 21th. Make sure to drop by by then, and don’t forget your Ben Franklin postcard when you’re there!